Make sure the On/Off Switch is turned on. Turn it on and off. Check control fuse in side of control box. Twist open the fuse holder and physically check the little fuse. You can see if the metal element inside is melted if it is blown. You can also use your digital multimeter to check continuity across the fuse. 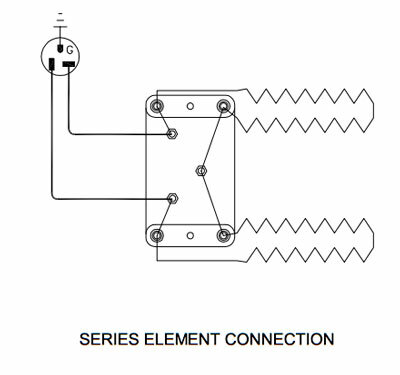 Check the branch element circuit fuses inside the control box. All kilns with more than 48 amps and many 3 phase kilns have branch fuses. Make sure the power cord is plugged into the receptacle. Reseat plug. With power off examine the electrical cord. Look for burned or melted areas and breaks or pinched sections. Look closely at the head of the plug. 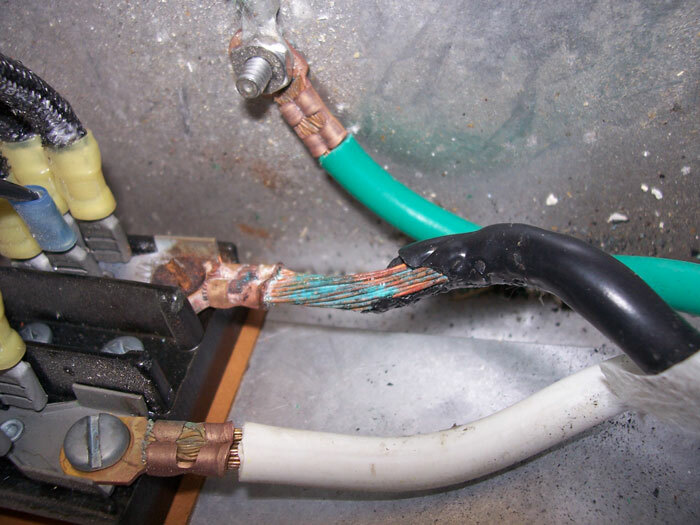 If there is an internal problem with the wires and the plug parts you won’t be able to see it but you may detect a softening or melting of the plastic at the plug head. With power turned on and panel open check voltage at the Power Terminal Block. If you see no voltage there then you know something is wrong with the power source. CAUTION: This test should only be done by an experienced person familiar with electricity and its dangers. Check voltage at the receptacle. CAUTION: This test should only be done by an experienced person familiar with electricity and its dangers. If there are approximately 240 volts coming into the control transformer (terminals 4 & 7) and there is no voltage coming from the transformer (across terminals 5 & 8) then you have a bad control transformer and it needs to be replaced. If there is no voltage coming into terminals 4 & 7, then test for it at the Power Terminal Block where the power cord comes in. If there is power there then look for a bad connection or wire between the power connection block and the transformer, i.e. a bad toggle switch, wire, or 1/2 amp fuse holder. If power is not there then go further back on the line and measure the voltage. Keep going until you find voltage, then look for the problem between that point with the voltage and the last point checked that had no voltage. If the transformer is OK and you know you have voltage going to the control board but the control still shows no display then the control board needs to be replaced. When these older controls are running a program and the toggle switch is turned off without pressing the STOP key first and then the switch is set back to on: the screen will blink and go blank for 10-15 seconds then come back on. Remove the wire connectors from the end of the fuse holder on the inside of the panel. Unscrew the nut that holds the fuse holder in place. Remove and replace with a new fuse holder. 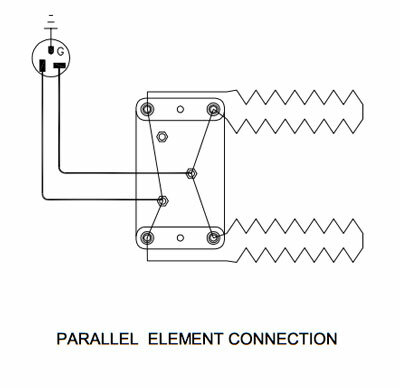 Reconnect wires. 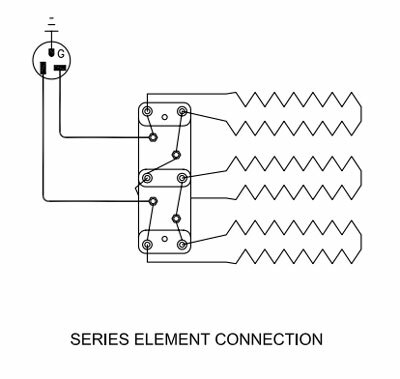 If there is power look for a bad connection between the power connection block and the transformer. With the power to the kiln off, open the control box carefully and make sure that nothing is touching any of the exposed wires. top of it- all wires are on one side of the transformer. Use a digital multimeter to check transformer operation. Set your digital multi-meter to AC volts, the next setting higher than 240 volts AC (on a lot of meters this is 600). With the meter you should be able to read 240 or 208 volts AC on the outer two wires at the bottom of the transformer. 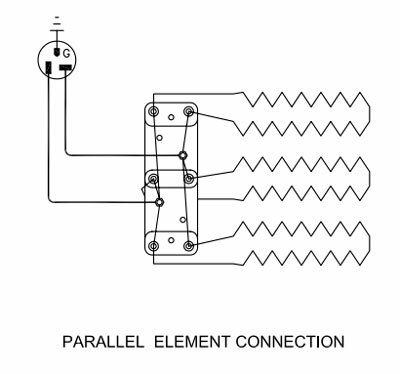 (These power wires come from the toggle switch and the power block). If there is 240 or 208 volts there everything is good up to the transformer. Set the meter to read 24 volts AC and look for this on the outer two wires of the 3 wires at the top of the transformer. If there is no voltage there then the transformer itself is faulty and you need to replace the transformer. If there is no power go further back on the line and measure the voltage. Keep going until you find voltage. Look for the problem between the point with the voltage and the last point checked that had no voltage. Replace transformer if you are not getting proper voltage. If there is proper voltage there then the control is getting the correct incoming voltage and that the board itself is probably faulty. Replace the control.